The Historical Novel Society is making me blush again. The Other Alexander was shortlisted for the 2014 HNS Indie Award. You can find my comments about the novel on the link below. Sometimes not winning feels just like winning. And remember folks, book three of the The Bow of Heaven trilogy will be out by the end of the year. The working title is Blood of Eagles. Thank you all for your patience. Like Gabriel, to be heard, it unfortunately falls to me to blow my own horn. The analogy is appropriate, for both the angel and I put our lips together to announce Judgment Day. His to herald the End of Time, mine to announce an award for writing. Since I don't plan to be around for the former, I have to say that of the two events, the latter has far more significance. The nice folks at eLit Awards have given The Other Alexander, book I in The Bow of Heaven trilogy, the 2011 Gold Award for Historical Fiction. 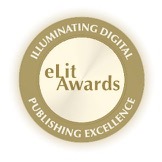 The eLit Awards "are a global awards program committed to illumination and honoring the very best of English language digital publishing entertainment." Remember, this coming Thursday and Friday, you can download a copy of Bow for free at http://www.amazon.com/dp/B005UO0QMI.